This record is a remarkable one for a number of reasons. One of those is that, being a Depression era release, it is quite scarce (and I don’t mean to sound braggadocious, I’m still surprised that I have it, myself). Another is that is one of a number of records of the 1920s and 1930s to feature black and white artists performing together, in this case Jimmie Rodgers with the Earl McDonald’s Louisville Jug Band. On the downside, this copy has certainly seen better days. The years have not been kind to it, and its sound reflects that. It’s still listenable, but has a layer of surface noise. Another bit worth mentioning is that the flip side of this record, which was released after Rodgers’ passing, features a recording by another blue yodeler who happened to be Jimmie Rodgers’ first cousin. Both sides of Bluebird B-5942 were recorded on separate occasions. The “A” side was recorded on June 16, 1931 in Louisville, Kentucky, the “B” side was recorded January 28, 1935 in San Antonio, Texas. The personnel of the jug band on the first side includes George Allen on clarinet, Clifford Hayes on violin, Cal Smith on tenor guitar, Fred Smith on guitar and Earl McDonald on jug, the same basic group as the Dixieland Jug Blowers. One seller claimed that it sold a total of 2,757 copies, but I have no idea how they came up with that number and whether or not it’s accurate, though those numbers don’t sound out of line. On the first side, the Blue Yodeler sings “My Good Gal’s Gone”, with outstanding accompaniment by Earl McDonald’s Louisville Jug Band. Though it was recorded in 1931, this 1935 Bluebird is the first issue of this recording. Takes “2” and “3” of this song exist, this one is the latter. 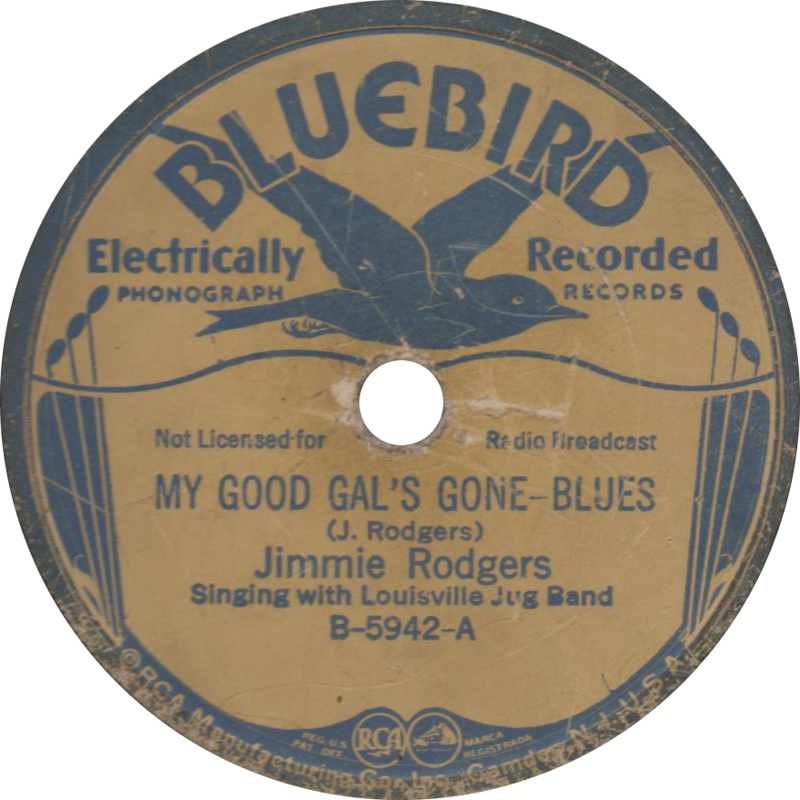 My Good Gal’s Gone, recorded June 16, 1931 by Jimmie Rodgers. On the “B” side, Jimmie’s first cousin, Jesse Rodgers sings “Leave Me Alone, Sweet Mama” in a style that reminds me of Cliff Carlisle more than Jimmie. Jesse stuck around for quite a while, later dropping the “d” from his name to become Jesse Rogers by the end of the 1930s. 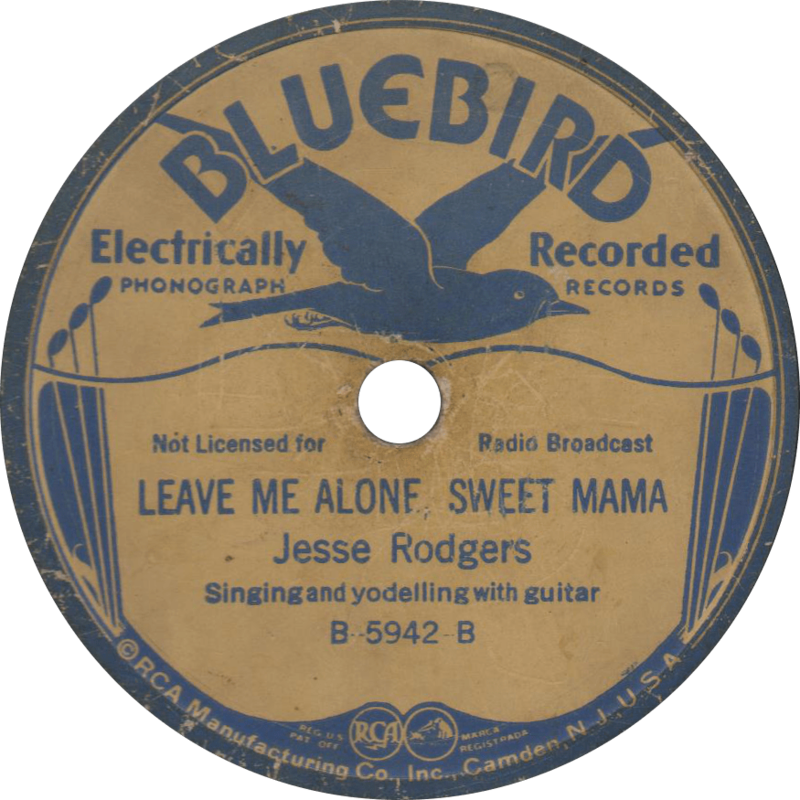 Leave Me Alone, Sweet Mama, recorded January 28, 1935 by Jesse Rodgers. This entry was posted in Records and tagged 1930s, 1931, 1935, Bluebird, Blues, Cal Smith, Clifford Hayes, Earl McDonald, Field Recording, Fred Smith, George Allen, Hillbilly, Jesse Rodgers, Jimmie Rodgers, Jug Band, Louisville, San Antonio, Singing with Guitar, Texas by R. Connor Montgomery. Bookmark the permalink.